We’re no strangers to the awesomeness of Soulphonetics. The fact that they’re celebrating their first anniversary at Harbee’s only makes us like them even more. It says a lot about their success as music makers, selectors and overall booty-shakin’ DJs extraordinaire. 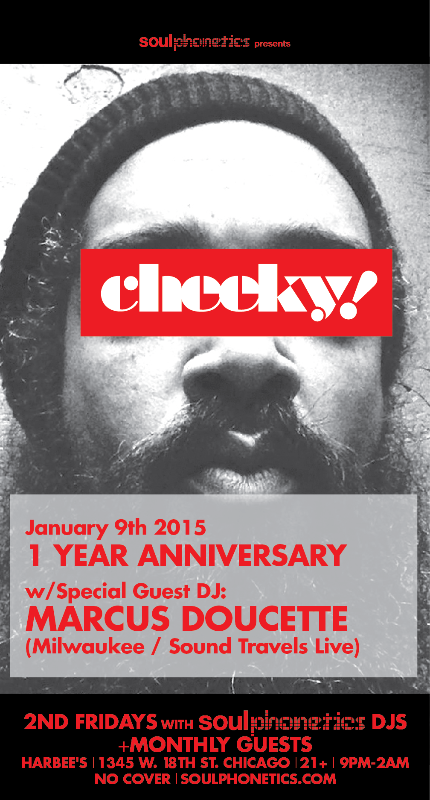 Join their anniversary celebration this Friday, January 9th at Harbee’s in Pilsen. They’ve invited DJ Marcus Doucette along for the night’s festivities. We asked Christian Vera a few questions about Soulphonetics residency at Harbee’s as well as some of their favorite songs of 2014. What has one year at Harbee’s done for your music library? Regardless of where we play our music library is always expanding in all directions, in different colors, in different genres, in different lengths, in different moods. You feel me? How does this residency differ from others? Hmm. I would would say that here we feel at home, cozy and able to just play without any issues from the promoter, owner, crowd & such. We like that feeling. It reminds us of our days at the old Butterfly Social Club and our dance Syndrome parties. What can someone expect to see and hear at “CHEEKY!”? Expect to hear and see anything and everything. One night Caswell wound up playing just drum & bass and cumbia while another night I only played deep house and hip-hop. In other words, musically we have no boundaries. You’ll see people losing their minds on the dance floor just taking in anything we feed them. What’s up with Soulphonetics in 2015? The cliche “bigger & better things” applies. We’re aiming for more gigs out of state and across the country. We want to release new music as well as new remixes we are working on for other artists. (Excuuuse the question, y’all but…) What were the most requested songs of 2014? What were your fave songs to play in 2014? We’ll continue the list of favorites in our next interview.